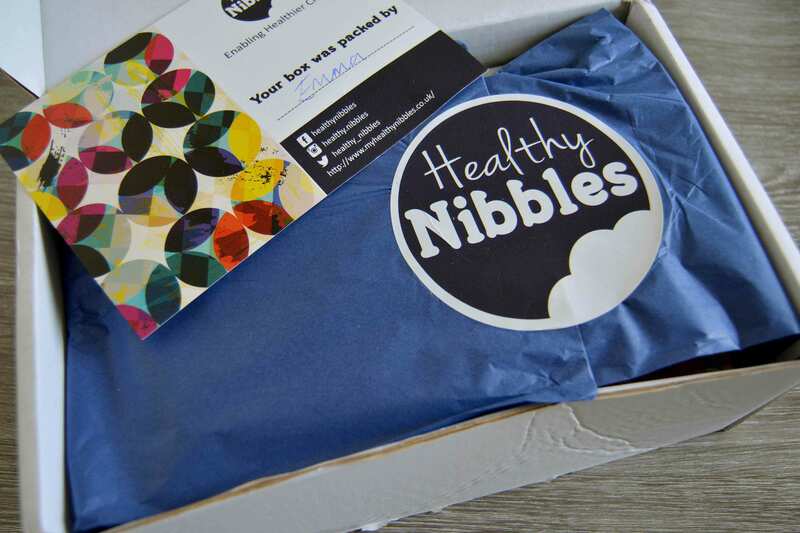 Healthy Nibbles Review & 50% Off! 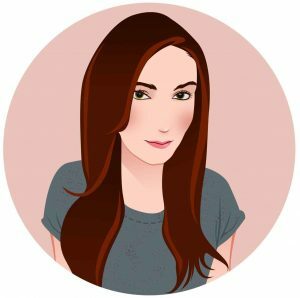 Living gluten free can be so difficult, especially when it comes to snacking. I always make sure that I have snacks in my bag when I am out and about as they aren’t readily available in many places. When it comes to snacking, I am always on the lookout for new gluten free snacks and never know what to purchase. Healthy Nibbles, makes this super easy! 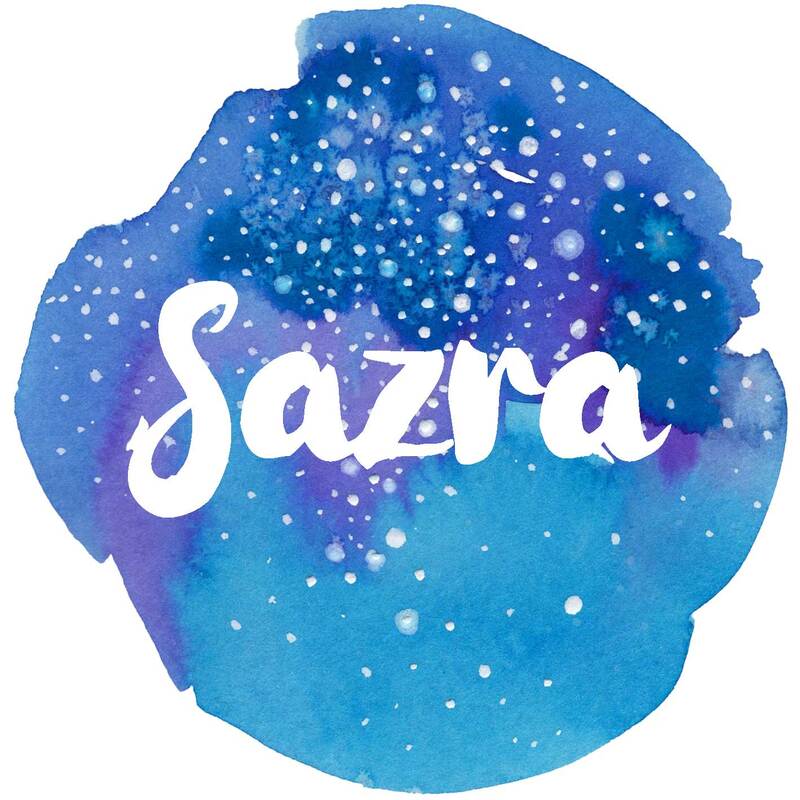 They are a subscription service which offer one-off boxes too, catering to those of a paleo, gluten free, vegan and healthy lifestyles. They come in three sizes: mini, box and super. They also offer some chocoholics boxes too! You can choose whether to have them delivered every 7 or 30 days to suit your needs. Sweet Potato Chips – Salted 40g. These were the first thing I tried and I loved them! A great salty snack. I bought a few more bags to keep me going from Holland & Barrett. Kintaro Nut Clusters – Hot & Spicy 50g. Clusters of crunchy cashew nuts, almonds and white sesame seeds combined with natural hot and spicy flavours. This sounds interesting! I haven’t tried these yet, so I can’t say how hot they are! Also available at Holland & Barrett. 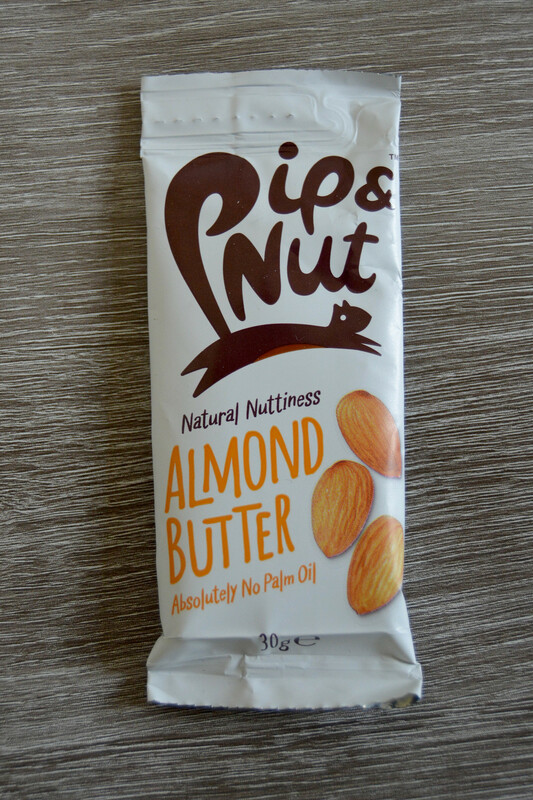 Pip & Nut Almond Butter 30g. I haven’t actually seen a travel sized portion of almond butter before. It’s a great idea for lunchboxes. It contains no palm oil too. There is also a larger sized version. Buy yours here. The Bondi Kitchen – Rosehip, Chia & Strawberry Raw Bliss Balls 42g. I love the sound of these! Strawberries are one of my favourite flavours. They are also vegan and dairy free, made from fruit, nuts, seeds and green tea extract. I can’t wait to try these! Snact – Apple & Mango Fruit Jerky 20g. I really like this jerky. I actually did a review of it earlier in the year. It is 100% fruit, vegan with no additives and preservatives, less than 65kcal per bag and made in the UK! See the full review here. Yummy Scrummy – Raw Chocolate Brownie 60g. Raw brownies are amazing. It’s rare to find one that is gluten free as well as being free from dairy, soya and refined sugar but this ticks all of those boxes. This raw brownie is full of nut and fruity goodness. Buy yours here. 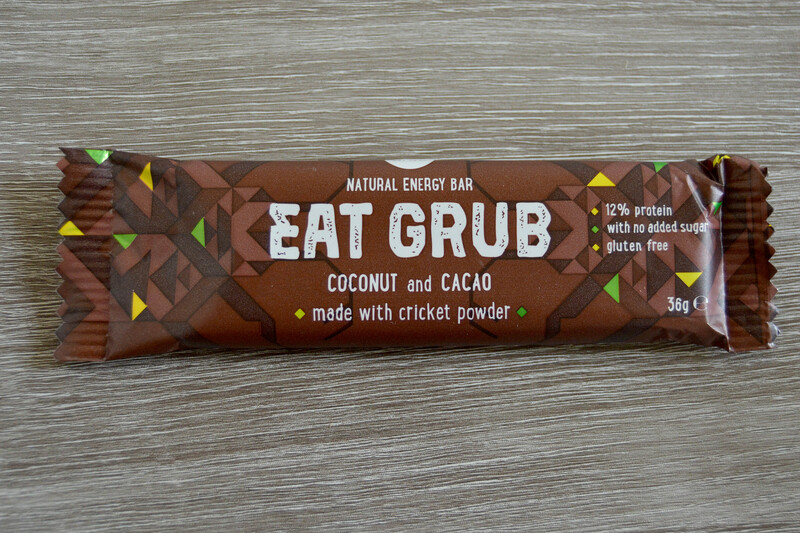 Eat Grub – Coconut and Cacao 36g. I’m not going to lie… this one scares me a little. It’s a natural energy bar made from cricket flour. I have never consumed insects before and I will be plucking up the courage to try this one. It’s high in protein and good for you. Be brave! 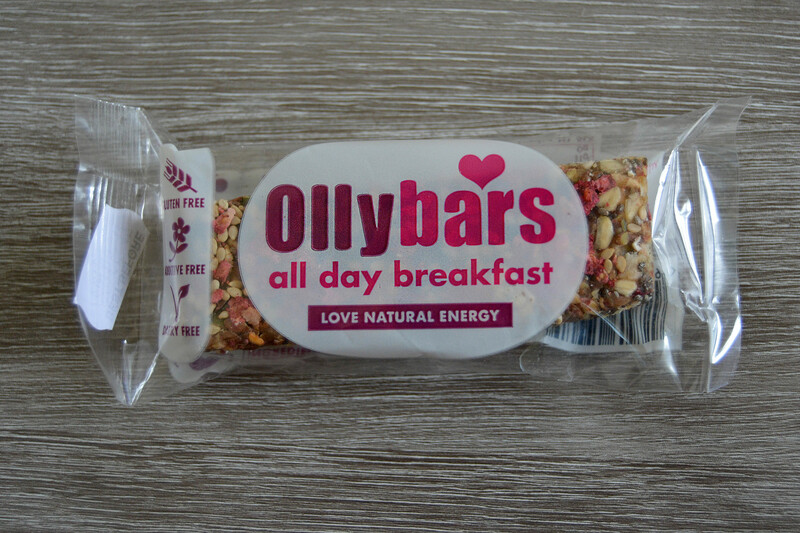 Olly Bars – All Day Breakfast 60g. This bar appeals to me a lot. Gluten and dairy free, it’s a natural energy bar suitable for breakfast, lunchboxes, snacks and to keep you going at the gym. It is made from nuts, fruit, oats and seeds. Think of it as a healthier cereal bar. It’s very pretty to look at too. Grab a box. Creative Nature – Raw Cacao Super Food Flapjack 38g. Another raw cacao product, but who would complain!? This is a raw flapjack with no gluten, dairy or nuts. Full of fruit and suitable for vegans! It also contains goji berries and maca. You can get these in bulk at a discount on their website at the moment. 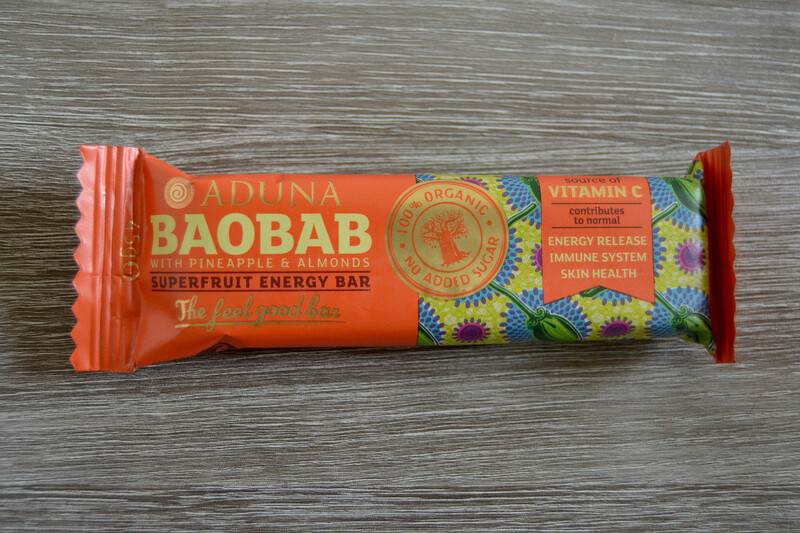 Aduna Baobab – Pineapple & Almond Superfruit Energy Bar 45g. A lovely looking energy bar with a source of Vitamin C which helps with your energy release, immune system and skin health. A tangy citrus flavour. It is stated in the bar that it is made in a factory which handles nuts, sesame seeds, gluten, milk and soya. This is disappointing as I won’t be able to eat it. I am surprised that this made it into the gluten free box but it doesn’t contain gluten in the ingredients. It would be suitable for those on a gluten free diet but not for those who suffer with Coeliac disease or have a gluten allergy or intolerance. I will not be able to try this one but I will pass it on to someone who will enjoy it! I spoke to Healthy Nibbles and Aduna about this bar and they confirmed my thoughts but were really helpful and lovely about it. Holland & Barrett stock this. I always have green tea at home including many variants. I thought I had tried them all but I have not seen raspberry & pomegranate green tea before. This looks really good and I love the packaging! I had this yesterday afternoon and it was delicious! It has added vitamins which is a bonus. You can get a full box here. Doisy & Dam – Quinoa, Smoked Tea & Vanilla Organic Milk Chocolate 40g. The packaging is so pretty for this soya and gluten free chocolate bar! A cardboard box with a foil covered chocolate bar inside. The box makes it easy to reseal, but you will probably not be able to resist eating the whole bar at once! A beautiful combination of flavours. Check them out. 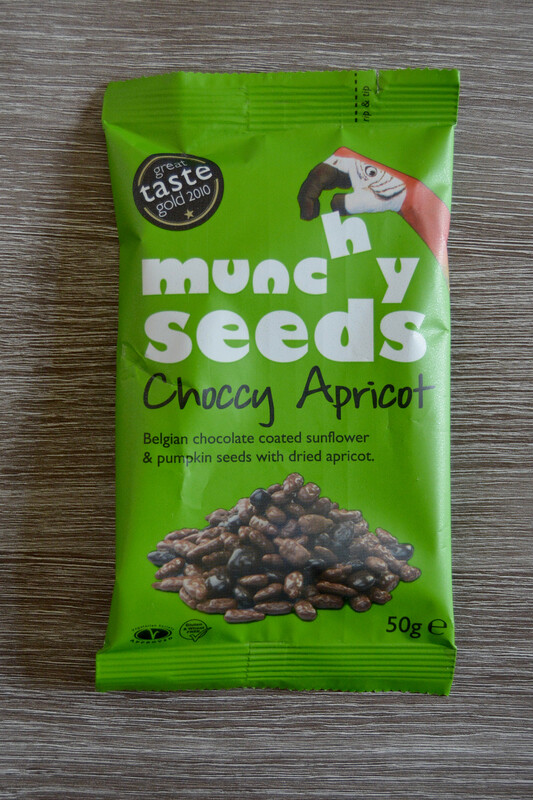 Munchy Seeds – Choccy Apricot 50g. I have tried these before and they are lovely. The pack contains 38% of your daily recommended intake of Vitamin E. It’s a fantastic topping for smoothie bowls too. Perfect for vegetarians! They also sell larger packs here. 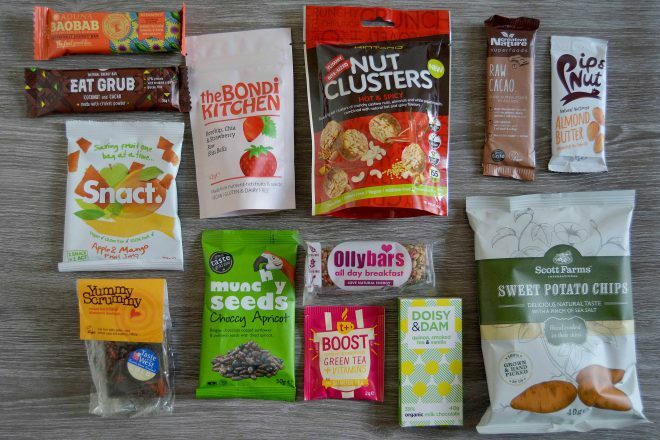 Get your first subscription box with 50% off by using code ‘firstnibble’. Free delivery within the UK. Order here.